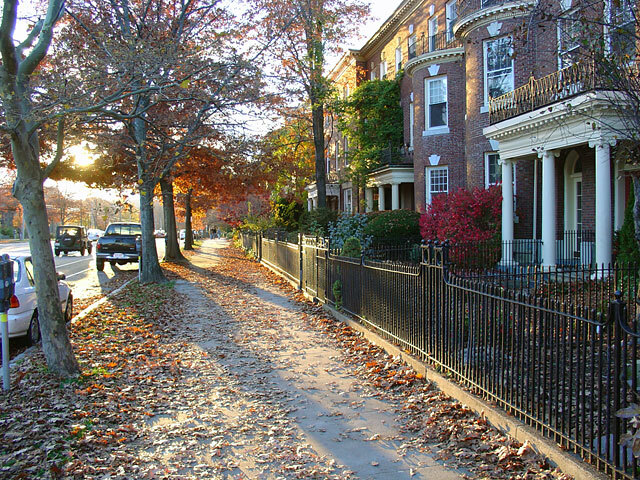 Known as “the most densely populated area of Brookline,” the Brookline Historical Society describes North Brookline as the ultimate mix between suburban and urban living. Prior to 1768, North Brookline’s Harvard Avenue was the primary path to Cambridge from Boston until the building of the Charles River Bridge in 1786. Before the trolley began to run in 1880, North Brookline was largely a swamp and farming community, with few houses scattered along dirt roads. However, the construction of the trolley brought large groups of Irish and Jewish settlers to the area. One of the most popular draws for North Brookline is the John F. Kennedy Historical Site at 83 Beals Street, which is where the former president was born. After spending several of his childhood years there, Kennedy later moved to another home in Boston. However, the old-style home still remains as a free museum. Currently, North Brookline has a mix of historic homes and apartment buildings. Despite its dense population, one only has to step off of busy Harvard Avenue onto one of the side streets, and the crowds begin to disperse. A mix of college students and families means that there are many affordable restaurants in the area. North Brookline is accessible on the B and C Green lines and is close to Winthrop Square. It can also be reached on the 57 bus via Watertown Yard to Babcock Street.